The first edition of linocuts for the Thailand Burma Flora Fauna project is complete, packaged, and being shipped out early this week! I’ve also listed several of them on my Etsy site in case you would like to add one to your art collection or to send one as a gift to a friend. 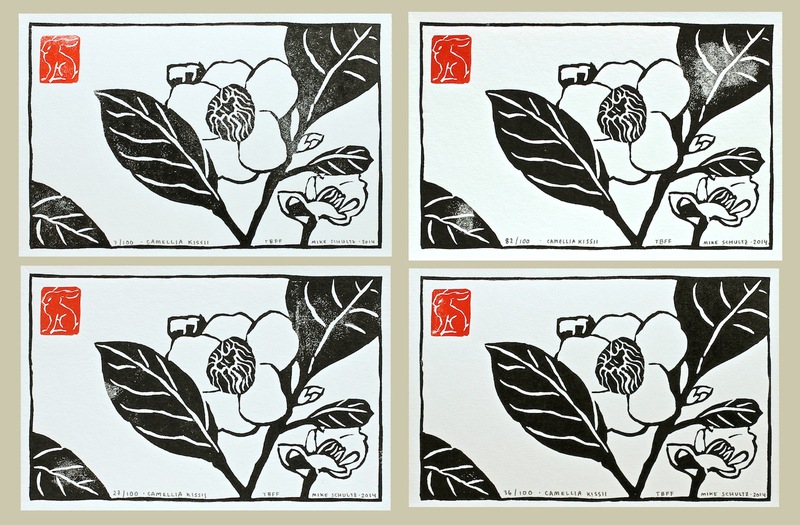 :) It features the Camellia Kissii flower found in Burma, said to be named after a botanist named Kiss. 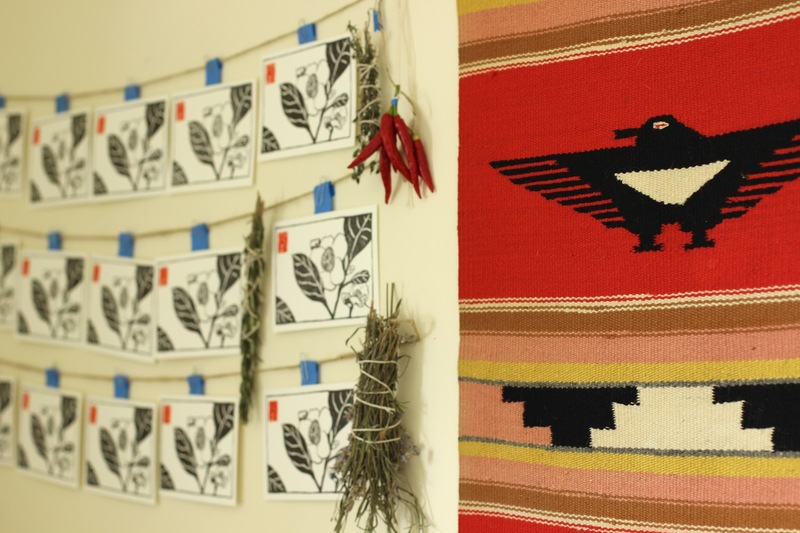 Drying linocuts, garden herbs, hot Thai chili peppers, and a favorite Navajo blanket on my studio wall. THANK YOU all so much for your continued patience and support as I learn and hone my skills as a printmaker. I am striving to bring you the highest quality work possible, and making this first print was a huge learning curve for me. I’m happy to say I’ve worked out a lot of the initial kinks in the process. 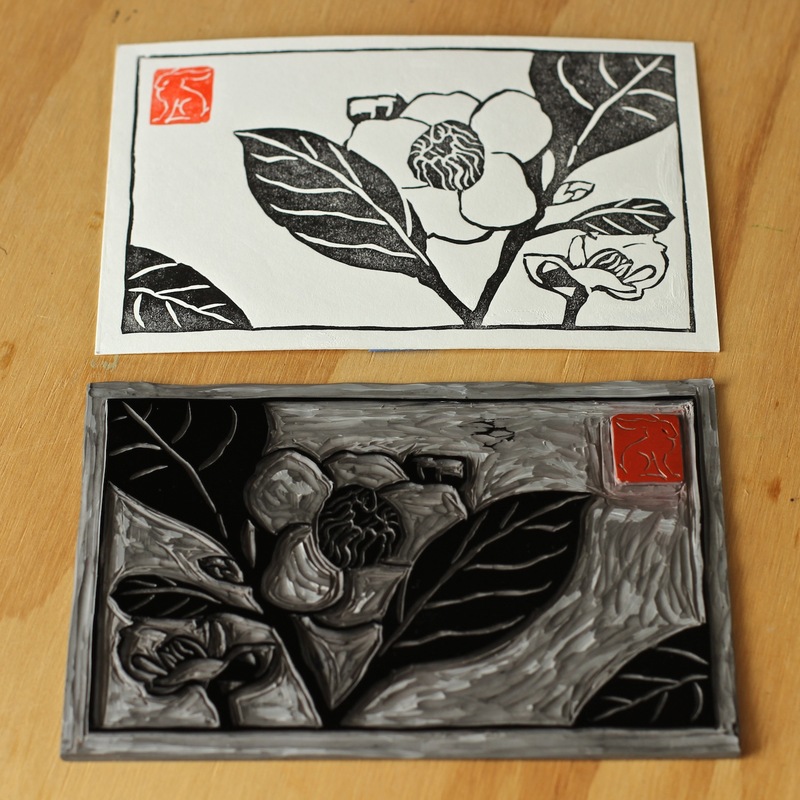 The linocut plate inked up (bottom) with a pulled print above it. 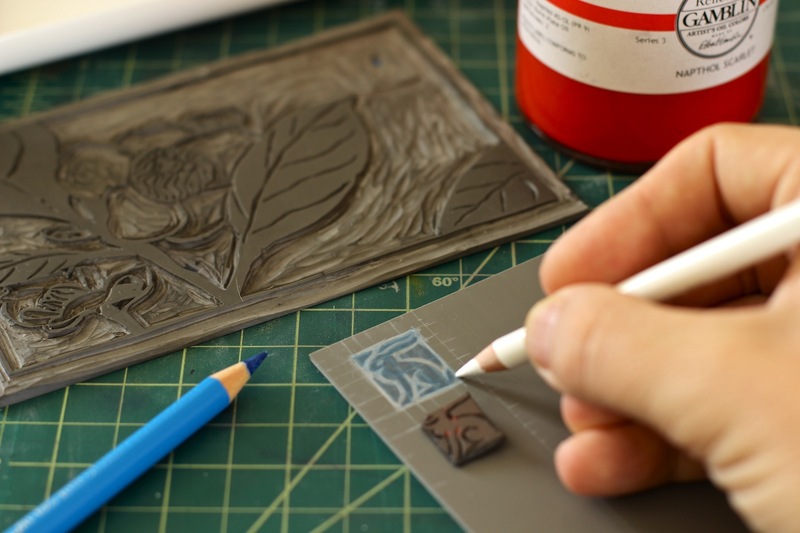 One tricky aspect of printmaking– is how to carve an image in one direction, that will look “correct” to our eyes when it is printed in reverse on paper. 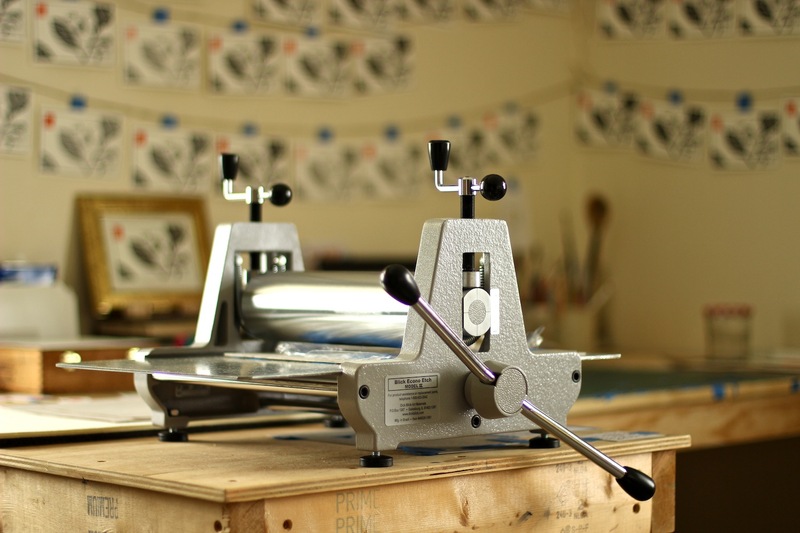 My printing press (dubbed The Little Workhorse) with studio walls filled with drying prints. Illustrating the variations between prints. 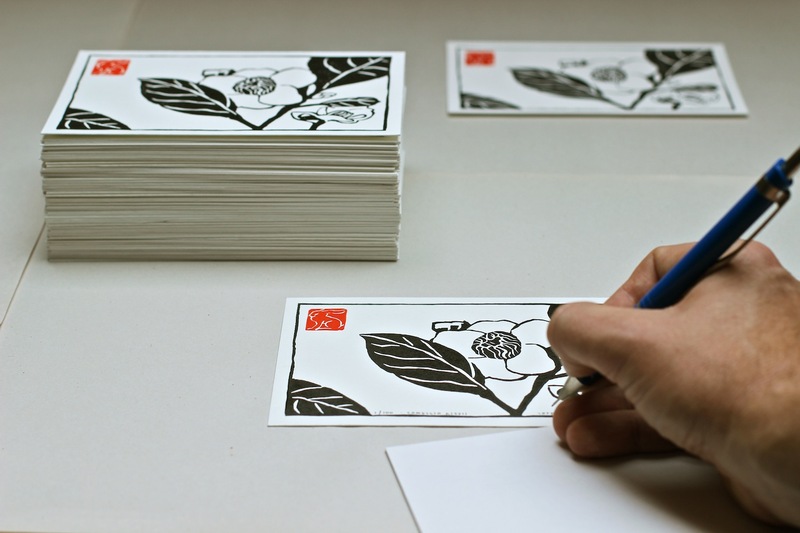 Making prints by hand is just that– a handmade craft. There is always an ebb and flow of variability and variation between the prints. Some are darker, some are lighter, some prints have more “character”. Some of the prints were lovingly touched up with a white opaque gouache, and others were trimmed down a bit– but all of them passed my eagle-eyes quality control check. As far as character goes, I even added two versions to the edition that have a random ghostly spot on the upper leaf (pictured above, upper right corner). I’ve come to enjoy the prints with a little character, as it makes each one a more unique. Studio walls with drying prints (plus a tiger print by Andrea Lauren peeking into the frame above my work desk). 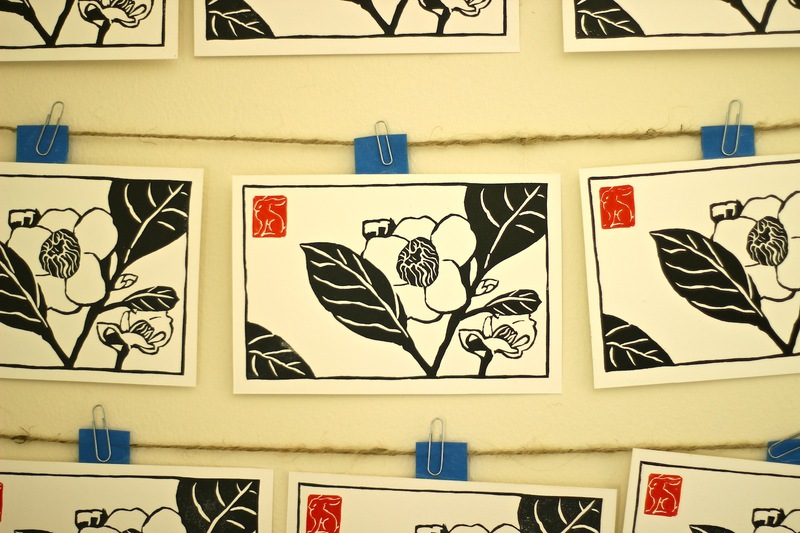 Drying linocut prints featuring the Camellia Kissii flower. 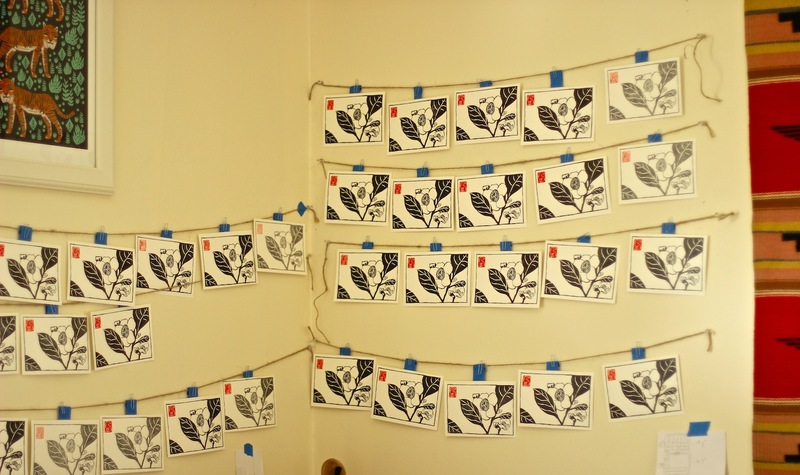 Pictured above, Camellia Kissii linocut prints drying on a state-of-the-art blue tape, paper clip and twine combination. This helps the prints to dry free of dust and smudges as oil based inks take longer to cure. It also helps to fit a lot of work into a limited space! 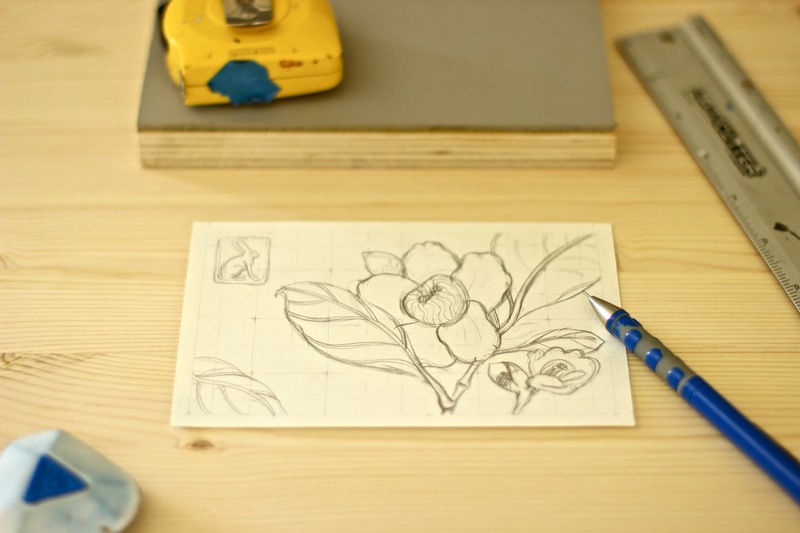 Throwback to drawing the preliminary pencil mock up before carving the Camellia Kissii print into linoleum. 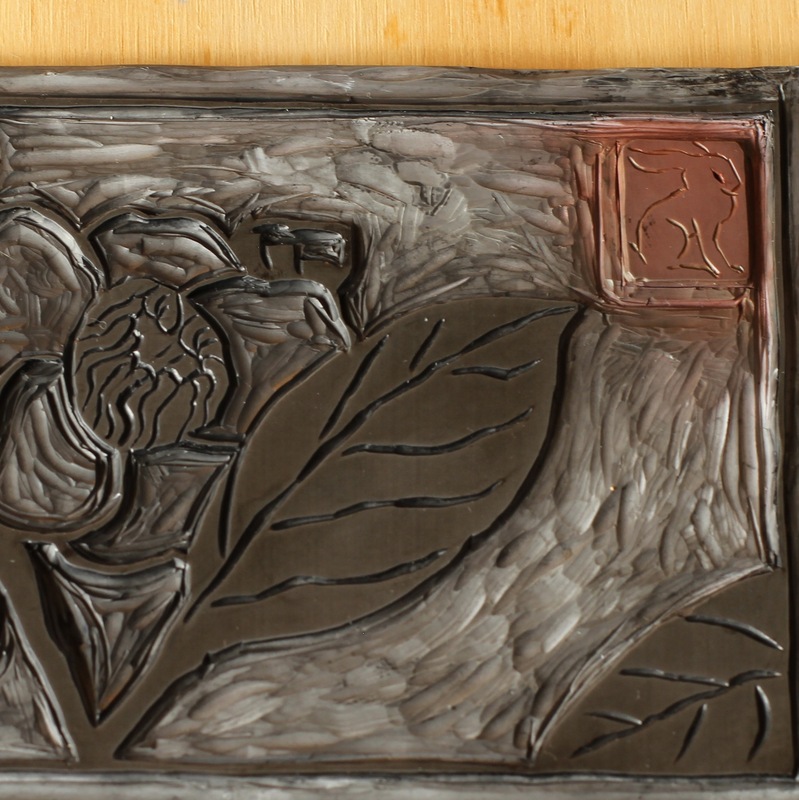 The linocut block with its new hare chop carefully spliced into it. The Clean Hands Club: This is what signing 100 prints looks like. From top right to middle bottom to left: signed, signing, and the to-be-signed pile. 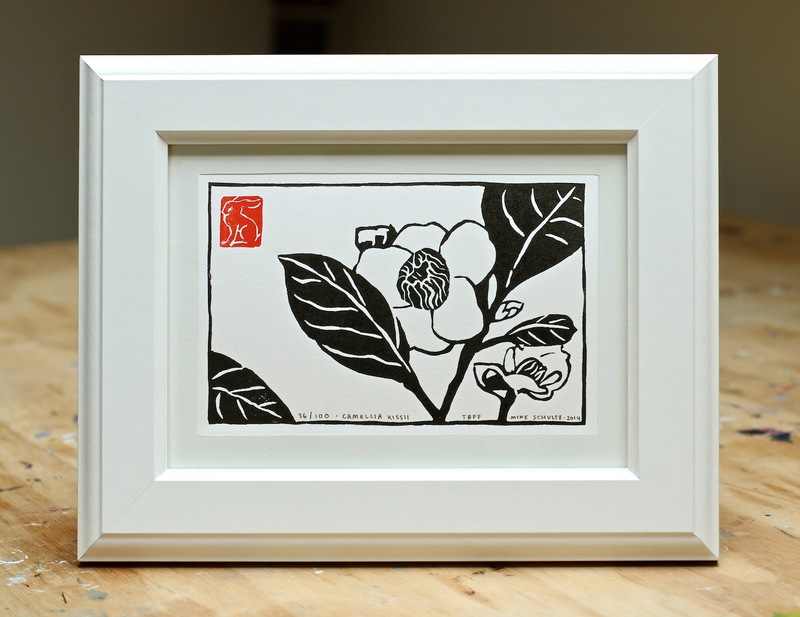 The Camellia Kissii print framed in a simple white frame! Next week, I’ll be sharing how I’m using monotype printmaking (one-of-a-kind prints made by drawing with ink on a flat copper plate) to physically work out the remaining imagery for the Thailand Burma Flora Fauna project! 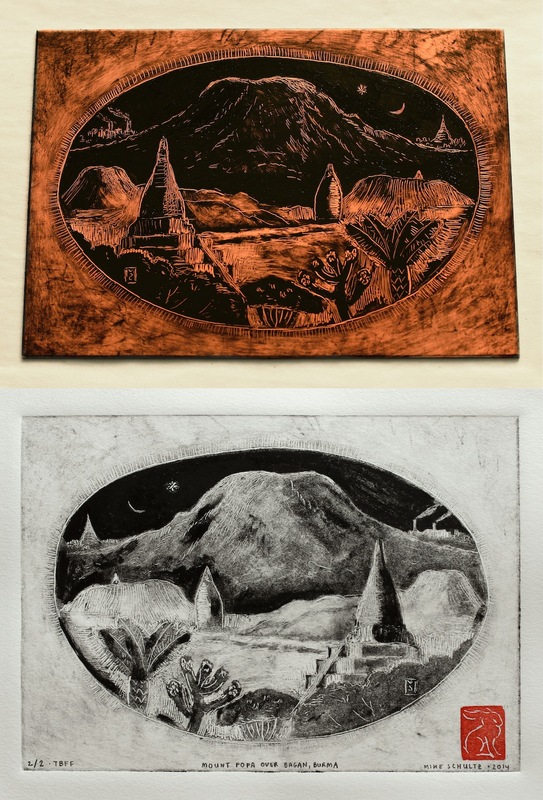 Below, you can see the original oil ink drawing on the flat copper plate, and the resulting transfer onto paper. The print shown is the second monotype pulled– a lighter after-image called a “ghost print”, also available on my Etsy shop. A monotype “ghost print” featuring Bagan, Burma that will be the central image in an upcoming TBFF print! Your prints are wonderful! Good luck on Etsy! Thank you, Gretchen! I appreciate that. Thanks so much for the positive words! This prints are really beautiful. In my opinion the chop makes all the difference. Thank you, Michael! I appreciate the comment. I do love a little red orange chop! 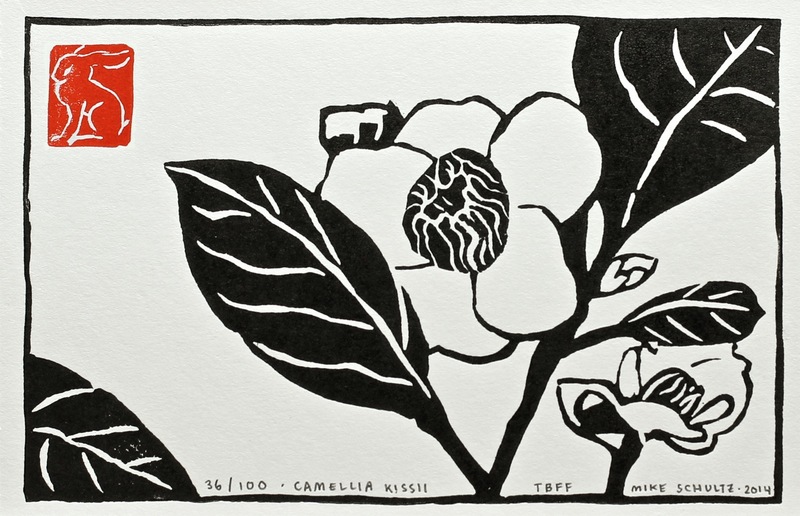 You are currently reading Camellia Kissii Print Complete! Plus Monotypes + Etsy at Mike Schultz Studio Blog.